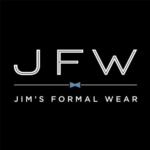 Yes I Do Bridal is an authorized dealer of Jim's Formal Wear. We offer rentals of all styles, colors, and sizes. Designers include Micheal Kors, Ike Behar, Calvin Klein, Lauren Ralph Lauren, Tony Bowls, and Jean Yves. Please contact us to find out how to get your Groom's Tuxedo FREE! Design and customize your own tuxedo. Pick your suit, shirt, tie, vest, cummerbund, pocket square, cuff links, shoes, socks, suspenders, and more. Click "Build A Tux" above to get started.